Whether you find yourself in the heat of the summer or you are packing for your next tropical vacations it is easy to get swept away by all the underwater world has to offer. Going snorkeling is a great way to get a glimpse of the impressive life under water. Sectioning off your day to swim amongst the fishes is only fun when you can really take in all the colors by having an uninterrupted view under the sea. The best way to do that is by opting for the best full face snorkeling mask. This allows you an unobstructed view of the buzzing life below you. We have found the best snorkel masks for your next snorkeling adventure and compiled them in a list below. This will ensure your next vacation is unforgettable. This traditional style snorkel mask is far from ordinary. It features a frameless design that provides a wider view than your typical mask. This low profile design makes swimming through the water easy and folds up small enough to easily fit in your travel luggage. The large field of view makes it an excellent mask for hunters as well as underwater photographers. The snorkel mask set includes a snorkel that is incredibly flexible folding to a compact size. The soft mouthpiece is small enough to actively reduce jaw fatigue and sits comfortably in the water. It is a dry snorkel which means it will protect against water entering your snorkel when submerged. Wildhorn Outfitters has made a high-quality face snorkel mask with Flowtech advanced breathing system. This allows for a natural & safe snorkeling experience. Giving you a complete 180° view will allow you to see more while underwater. This is one of the top snorkel masks and is made using only the highest quality materials including a shatterproof window. 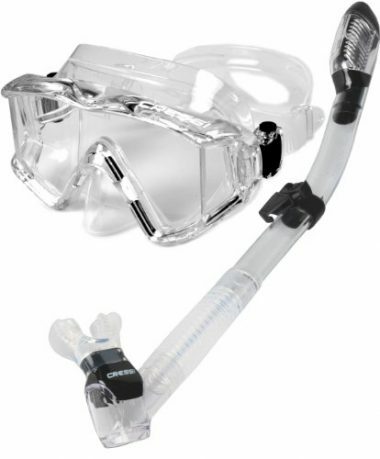 This comfortable eliminates the need for a snorkel allowing you to breathe easily through the nose and mouth. This is 20% larger viewing experience that allows you to be seen up to four times better than before making this a safe option for the family. Extensive ventilation systems prevent this mask from fogging up from your breath. 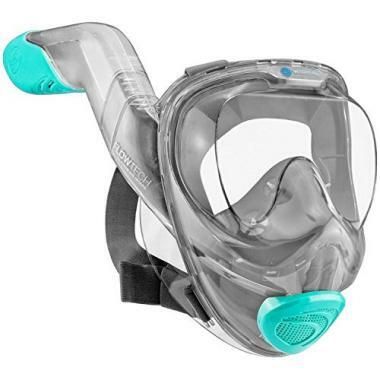 When diving below the surface this mask features a watertight valve ensuring that you do not breath in any water making it a safe option while snorkeling. 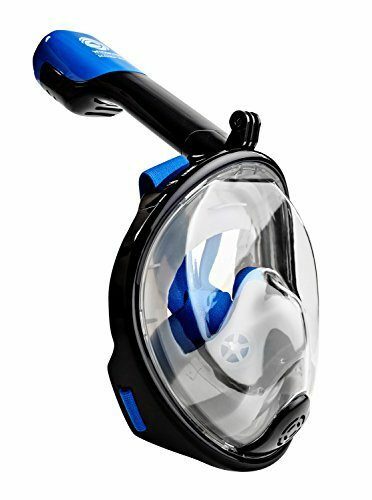 This snorkel mask full face gives you an a complete unobstructed 180° view of all the life underwater. This mask allows you to ditch the snorkel and avoid the gag reflex. This mask allows you to easily breathe through your mouth our noise. No need to worry about fogging your mask up and losing your visibility, this mask features an impressive anti-fog design. Film your trip with the easy GoPro camera mount on the top of the mask. This mask has excellent seals and strong valves to ensure that no water enters your mask. This mask has a unique look that allows it to be used by kids and adults alike. Due to the large amount of air in your mask you will find that your head will be more buoyant keeping you closer to the surface. The mask design makes this an easybreath snorkeling mask that allows you to see even more. 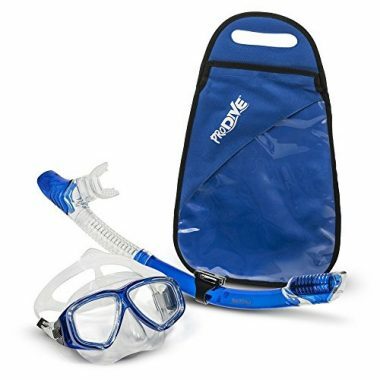 This value snorkel set comes in a complete set with everything you need to get in the water. A mask and snorkel will help you explore the underwater world while the waterproof gear bag will make it easy to travel with all your gear. A water-tight tempered glass lens allows you to see underwater with ease. Made using durable impact resistant materials this mask can even withstand deep water pressures making it transferable to a scuba mask. With anti-fog technology, you are guaranteed to be able to breathe freely underwater without fear of the mask fogging up. The snorkel mask that is included in this packaged deal is made with quality in mind. Being a dry snorkel means that you don’t have to worry about water entering your snorkel when diving below the surface, or if you encounter some waves. This is an important safety concern and will give you peace of mind to snorkel even longer. With it’s flexible design it can be positioned to your comfort and folds compact for easy travel. ProDive has included a money back guarantee with your purchase so you can buy your snorkel with peace of mind. This mask has a unique curve in the glass which gives you an extra wide view. Side windows give you even more viewing area. Made using a durable polycarbonate frame this mask is built to last. The silicone rubber skirt features a unique double feathered edge which allows it to sit tight against your face giving a perfect seal to ensure water does not enter. Easy to use, this mask has a quick-adjust strap that ratchets to give you your desired fit. The snorkel in this packaged set is just as impressive as the mask. The flexible mouthpiece is made from a soft silicone which fits comfortably in your mouth and reduces jaw fatigue. A flexible tube can be positioned to your comfort. It also is able to fold down for easy travel. The top of the snorkel has a high-end dry snorkel valve. This allows you to no longer worry about water entering your snorkel and risk choking while in a vulnerable situation. This is an excellent safety feature to ensure your dive is fun and enjoyable. This scuba mask comes as a set with a mask and snorkel. The large goggle size gives you exceptional downward and side to side vision. Made only high grade silicone products this mask sits comfortably against your face for longer swims. The seal on this mask is double edged which means that you get guaranteed airtight comfort without worry of water seeping in. A separate nose pocket is easy to reach even with thick gloves. This is a great way to easily equalize ear pressure. This low volume snorkel mask is great as it reduces the bulk that goes with your dive. The snorkel in this packaged deal is far from ordinary. A perfect buy for snorkeling and scuba diving, this snorkel has a flexible tube that can effortlessly be maneuvered as you desire. A splash proof dry guard valve is at the top to drastically reduces the chances of water entering the tube. If water does enter, the one-way purge valve makes it easier than evr to blow the water out of the tube. The angled mouthpiece is designed to comfortably fit into your mouth. The flex tube allows this tube to easily be swung out of your way when scuba diving. Snorkel mask reviews love the frameless design of this face mask. This mask comes in a variety of colors and works well as both a snorkeling and scuba diving mask. Made from silicone means this mask is going to last you many seasons to come. A wide angles lens is made with an impressively durable tempered glass. 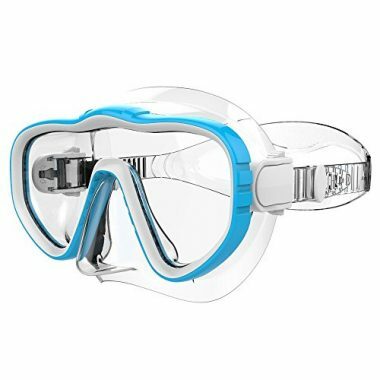 This gives it an anti-fog technology that allows you to see better underwater. A solid seal prevents water from entering the mask while swimming. Easily adjustable buckles gives you the perfect fit no matter your face shape. 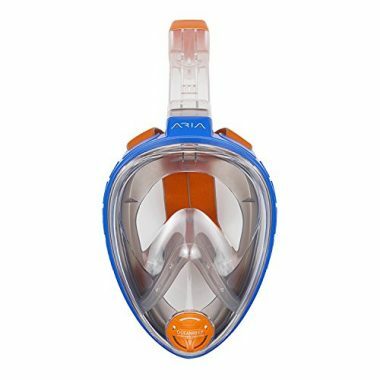 This full face mask gives you an unobstructed view of the underwater world. These masks have become increasingly popular as you can see in almost every direction. This face mask is incredibly easy to use. You will never have to worry about struggling to hold a snorkel in your mouth again and experience the dreaded mouth fatigue. This simple design allows you to breath freely from your mouth or nose. This mask has a single tempered glass lens which shows the high end quality of this mask. Being scratch and shatter resistant ensures that this mask will last you many years to come. The single lens system will ensure that you have an unobstructed view of all the life underwater. Made using the highest of technologies, this snorkel mask will allow you to go from the surface of a pool to the depths of the ocean without struggle. Withstanding the depths of the ocean is easy with a leak proof comfort seal. Made using flexible silicone, this mask fits snugly against your face and molds to the shape. A skirt ensures that you have a watertight seal. The silicone face strap is easily adjustable to give you the best fit. This full face snorkel mask makes swimming underwater even easier. Giving you an extra wide, uninterrupted view of the underwater world this is the top snorkel mask design on the market. Being able to breathe through your nose or mouth with ease will give you a more comfortable experience. Breathing naturally makes this mask an excellent choice for kids. Coming in many different sizes you will be able to get one for the whole family. Not having to put anything in your mouth will eliminate any chances of having jaw fatigue. 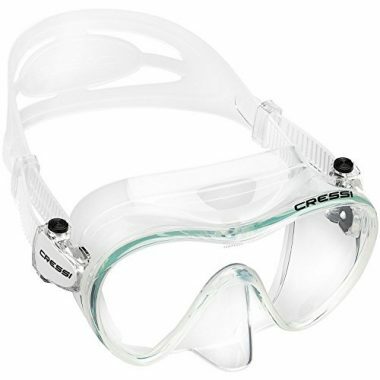 An anti-fog design allows you to snorkel without fear of having your glass fog mid snorkel. 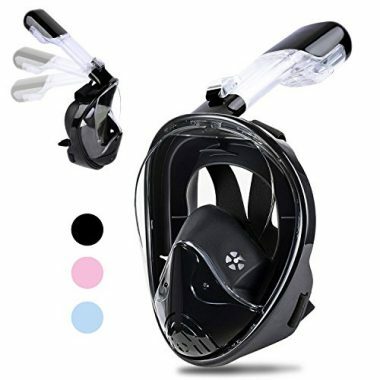 This easy to use mask comes equipped with a dry snorkel which will ensure that you do not ingest any water when diving under the ocean surface. The masks on our list vary drastically in design however they all have a few key features that you will want to look for in your next mask. This is of the most important features in a mask. Ensuring your mask fits comfortably to you will make you want to use it more often. Many scuba masks come with an adjustable strap that will allow you to have a personalized fit. This will go a long way to making you feel more comfortable under the water. When your mask fits comfortably, chances are it will sit closer to your face and therefore work better. There is a lot of condensation build up in snorkeling masks that over time will cause your snorkel to fog up. This is caused by sweating, and by your nose. Luckily, there is an anti-fog technology that masks are treated with to prevent this from happening. This is important as it will greatly obstruct your view and you will find yourself having to surface often and wipe out your mask. Opting for a higher quality mask that has anti-fog system will allow you to effortlessly get more from your snorkeling experience. There are more styles now than ever before for masks from frameless to wide angle. This is the most important consideration as when snorkeling your main goal is to see all the life that is buzzing underwater. The full face masks offer the most range of view being that you can see a full unobstructed 180°. This is highly desirable but is not the only way to do this. Most masks will give you a wide angled view and sometimes even an exceptional downward view. A frameless design will also help you to see even more while underwater. All masks will have seals that allow them to sit tightly against your face. The quality of these seals is important to ensure that you do not have water entering your mask. Water entry will cause your mask to fog, water to pool at the bottoms and force you to surface and clear your mask often. Your goal is to have a clear unobstructed view of the amazing underwater world and the only way you can do that is by being able to see. When water gets into your eyes, specifically salt water, it will burn your eyes and make the experience much less enjoyable. Opting for a mask that has strong and durable watertight seals will make your experience underwater much more enjoyable. 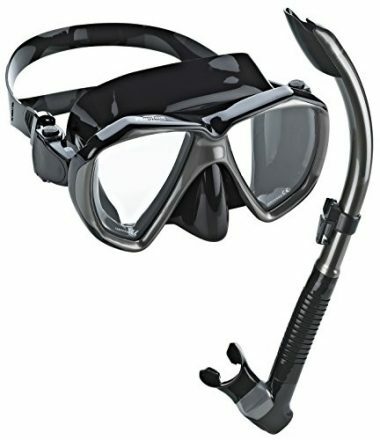 As a lot of the masks on our list have a snorkel included either by a design or as an included bonus you will need to know some features of the snorkel to look for as well. This may seem weird as you are going to use it in the wet water but this is the most important feature to look for. A dry snorkel will have a valve at the end of the tube that sits outside of the water. This valve will ensure that no water enters your snorkel. This is an important safety feature as you do not want to be swimming in the ocean and inhale some water if a wave comes and start choking. This is especially important for kids and not so strong swimmers. 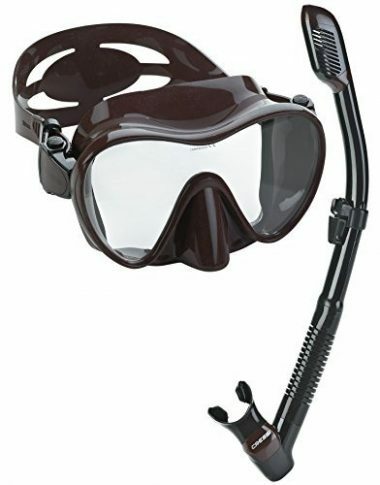 This type of snorkel is great for waves, unintentional splashing as well as purposeful dives. Having a dry snorkel gives you more range to your snorkel as well as you are free to dive deeper underwater without fear of water entering your snorkel. 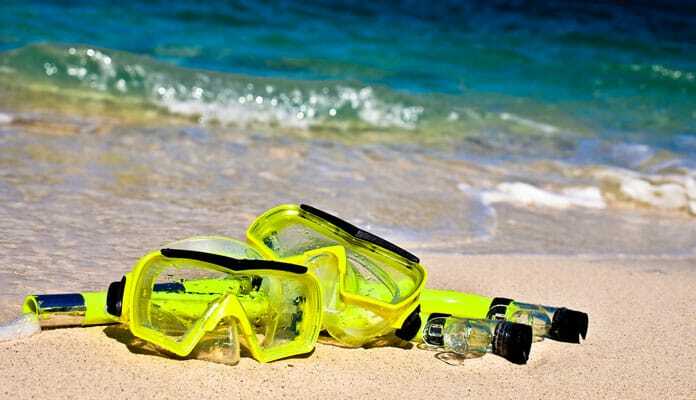 As snorkeling gear is most often used on vacations, you will want to look for a snorkel set that can fold down compact enough to fit into your luggage. This will allow you to bring your snorkel gear with you everywhere you go. The flexibility does more than just that, it also ensures that your snorkel sits comfortably in the water. Being easy to adjust to your ideal position will prove very valuable when snorkeling. Finally, when using it for diving purposes you can easily twist your snorkel out of the way to make way for you regulator. This is a large opening at the base of your snorkel that will make cleaning a breeze. For those snorkels that aren’t a dry snorkel, it will also make it easy for any water to escape your snorkel when needed. It is important that the mouthpiece of your snorkel fits comfortably in your mouth. We recommend opting for a flexible silicone piece that is small enough to fit into your mouth with ease. Opting for a snorkel that is flexible will allow you to get the most comfortable fit as it will not pull your mouth in a certain direction. Mouth fatigue is the reason that so many snorkelers have to stop before they are done so make sure that yours fits you comfortably. One of the biggest parts of snorkeling is your mask. This will allow you to see all the beauty of the underwater world. Having a mask that fits properly and works as it is supposed to will greatly reduce your stress. We have answered some of your questions regarding your mask that will help you get the most of your experience. Q: How Does A Snorkel Mask Work? A: A mask uses suction and a strategically placed piece of flexible material (usually hypoallergenic silicone) to ensure no water enters your mask. A good quality and properly fitted mask will let you explore as long as you want without leaking or fogging. This is done by utilizing the piece of silicone which will fit around your eyes, below your nose, and along your cheeks and create a pocket of air. It will be flexible enough to move with your face as you smile or move your mouth and maintain the seal it creates. Q: How To Clean A Snorkel Mask? A: This depends on a few things. If you are swimming in salt water you will need to clean your mask using fresh water. This can be as simple as fully submerging it in the water. You basically need to get the salt off the mask which can cause it to deteriorate. No matter where you are swimming you want to ensure that there is no debris on your mask before you store it. If there is sand stuck to your mask, for example, it will act as sandpaper. You will get home to find that your mask is scratched – something you want to avoid. You don’t need to spend loads of time cleaning your mask. Simply ensure that it is thoroughly rinsed if you are in saltwater and free of debris. Q: How To Keep A Snorkel Mask From Fogging? A: There are a couple ways you can keep your mask from fogging up while you’re snorkeling. The first is by simply spitting into your mask and rinsing it in the water. It may seem gross but it gets the job done. If this doesn’t sound appealing to you can use toothpaste – yes, toothpaste. You just need a little on the tip of your finger. Rub it over the inside of your lens. Be sure to have a thin coating over the entirety of the lens. Any part that you don’t cover has a higher chance of fogging. When you are done simply rinse the excess off in the water. Don’t rub the lens with your fingers, just swirl the water gently until you can’t see the film of the toothpaste. These are inexpensive ways to ensure your mask doesn’t fog. Of course, if you are renting your mask you can ask the shop for some defogging spray. But if you are in an isolated area these tips will ensure you have the best time possible. Q: How To Wear A Snorkel Mask? A: Wearing your mask properly doesn’t take too much effort. If your mask fits properly you are ¾ the way to getting in the water. However, there are some things you should keep in mind on your next snorkel trip. You should never wear your mask on your forehead, especially if you are in choppy water as it can easily get knocked off. Most masks don’t float which can leave you with a lost deposit or buying a brand new mask. Instead, if you need to take it off wear it around your neck. It will also take some time getting used to not being able to breathe through your nose. Before you get in the water put your mask on and get used to breathing through the snorkel. Once you feel ready wade into the water and put your face into the water while breathing through the snorkel. Not only will this ensure it works properly, but also instill some confidence before you take the plunge for real. Q: What Size Snorkel Mask Do I Need? Q: Why Does My Snorkel Mask Leak? A: Most often, your snorkel mask is leaking because you aren’t wearing the right size. To rule out all other problems, first, you will want to remove the mask and thoroughly inspect the integrity of the seals. Sometimes, a simple grain of sand or bend in the mask can wreak havoc on your snorkel experience. You will also want to make sure that your hair isn’t in the way, you aren’t wearing glasses, your strap is on tight enough and that the mask is centered in your face properly. When you are sure it is not a simple error, check the sizing. You may simply be wearing a mask that is too small/large. 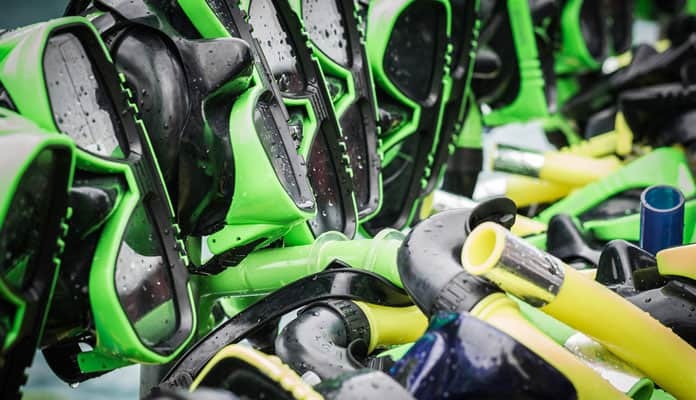 As snorkeling gear is most often used in saltwater, there are a few cleaning procedures you will want to follow to ensure the longevity of your gear. As with all your gear that makes it into salt water, you will want to rinse your gear. Using warm fresh water, give your mask and snorkel a quick 30-second rinse and allow it to air dry. This will stop the corrosion effect that salt build up will have on your gear. After your gear is dry, you can pack it away as long exposure to the sun can warm the seals as well as melt the plastic or silicone used. This quick care routine will allow you to enjoy your snorkel gear for years to come. Snorkeling is an excellent way to get out in the water and explore the impressive world underwater. This has been a long time favorite summertime activity. Being that you do not need a lot of gear, it is an affordable way to have fun for the whole family. Having your own snorkeling gear, including a mask, will ensure that you and the family can have fun in the water whenever the mood strikes. Any of the masks on our list are guaranteed to take your next vacation to the next level. Do you snorkel often? Have you tried a mask on our list? Chat with us about the key features you look for in a dive mask in the comment section below.